China’s been playing hardball with the U.S. over trade talks. There’s good reason: they’re gunning for the title of Top Global Economic Power, above the U.S. and other players. They’re embracing the short-term pain to win the long-term fight. They have growing problems, with slowing growth and exports, and we’ve heard much about this lately from Main Street. But those are only symptoms. Deep down, they have a demographic problem, an overinvestment-in-infrastructure problem, and a real estate problem. Today, let’s talk about that last one. I recently talked about Japan’s housing crisis. There, 8 million homes stand empty (that’s 15% of their market)! Well, compared to China, Japan’s real estate problem is a minor crack in the foundation. In China, 65 million homes stand empty! That’s 22% of all urban homes there. A quick note on the Chinese city tier system: While the Chinese government doesn’t officially recognize this system, it’s become a popular way for people and businesses to differentiate between cities, which reflect differences in consumer behavior, income level, population size, consumer sophistication, infrastructure, and so on. Tier 1 cities are the most developed in the country, with the most affluent and sophisticated consumers. They’re crammed full of people, and as urban metropolises, they have a huge economic, cultural, and political influence in China. Tier 1 cities include Beijing, Shanghai, Guangzhou, and Shenzhen. Now look back at that first chart. See how Tier 2 and Tier 3 cities share the largest proportion of empty homes? That’s where the greatest overbuilding has been as Tier 1 cities run out of space to build. But Is China’s Problem Worse than Japan’s? I said earlier that, compared to Japan’s empty homes problem, China’s is much more severe. Of course, we must consider that China is a much larger country than Japan, with 1.4 trillion people compared to Japan’s 127 million (I rounded up those numbers). A fairer comparison would be between China’s 465 million households and Japan’s 49 million. 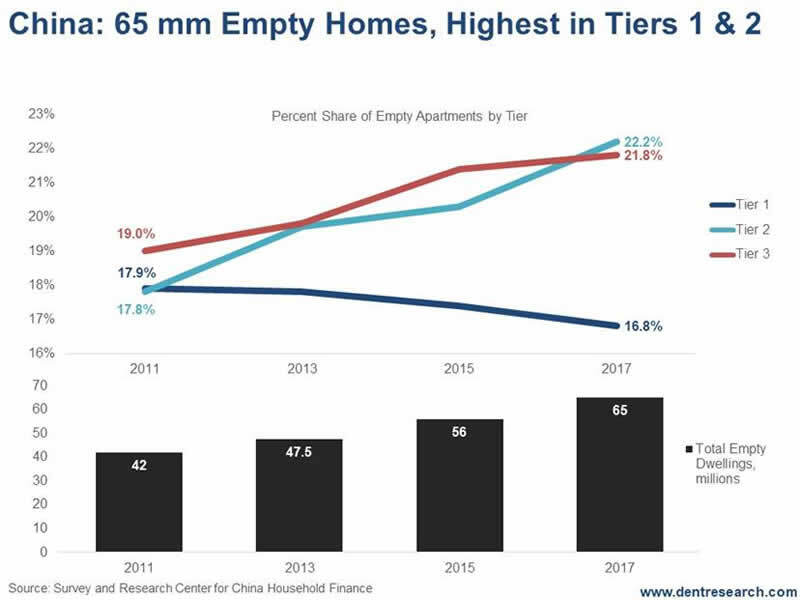 China’s empty homes as a percentage of urban households are 14.3%. Japan’s is 16.3%. But that’s not counting empty homes in China’s rural areas. I couldn’t find numbers of the rural empty-homes situation, but I’d be willing to bet it’s high enough to make the situation in the Red Dragon far more precarious than in the Land of the Rising Sun. Besides, 75% of Chinese net worth is in real estate! “Build it and They Will Come?” – Hardly! Japan’s empty homes are concentrated in rural areas, where they’re worth much less. And while there was some overbuilding, Japan’s biggest problem is a dying population. China, however, is home to so many empty homes… well… because the government simply overbuilt! Of those 65 million empty urban homes in China, 23 million – or 35% – have been built just since 2011. Vacant homes in Tier 2 cities have gone up the fastest as a percent: 18.8% to 22.2%. Empty Tier 3 city homes have been the highest in numbers, but have grown a little less in percentage terms, from 19.0% to 21.8%. Home sales have fallen around 15% since May 2018 in these cities, thanks to the slowest demand. That’s a sure sign of the inevitable housing collapse ahead. 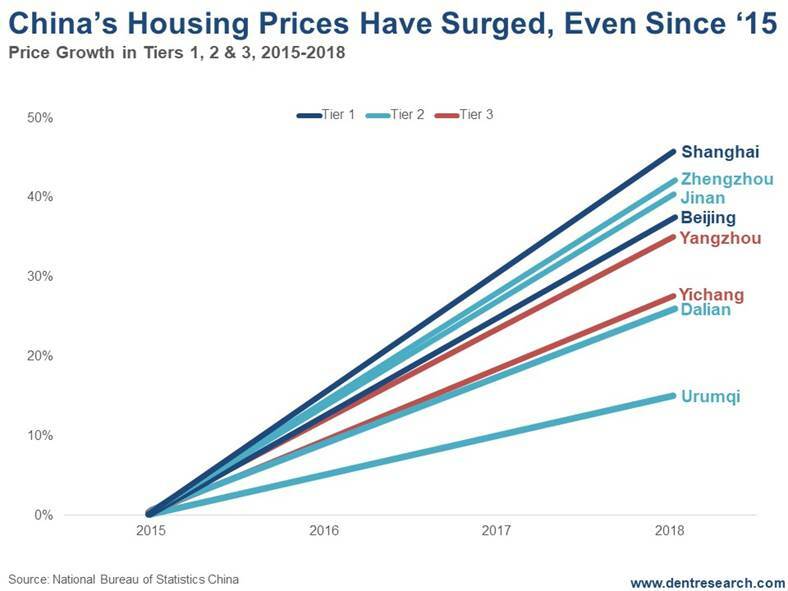 Home prices have been the strongest in Tier 1 cities like Shanghai, up 47% in the last three years, and Beijing, up 38.5% during the same time. The top Tier 2 city has been Zhengzhou, up 42% since 2015. And the top Tier 3 city has been Yangzhou, up at 37%. But remember: The bigger the bubble, the bigger the burst. China is the victim of the biggest overbuilding spree this century. As a result, it’s enjoyed the greatest bubble compared to income of any major country. Accordingly, it will suffer the worst when the dream crumbles. My bubble model forecasts a Shanghai property price burst of 78%! And it could take over a decade to play out. That’s greater than the 67% real estate crash Japan endured in the 1990s, when it had overbuilt and bubbled into its 1991 peak. The U.S. only suffered a 34% decline in home prices during the 2006-2012 crash. With 75% of Chinese net worth in real estate, this will cause the greatest evaporation of consumer wealth in history. China’s playing the long game in the trade war with the U.S., but it may have overestimated its strength. Tread carefully if you’re investing in real estate. Right now, the markets are walking a hair-thin tightrope with Chinese as the greatest foreign investors in English-speaking markets like ours.